The high-throughput solution for single-infeed and single-discharge applications. The C-shape continuous platform elevator is the tried and tested solution for the high- throughput elevation of boxes, totes, cartons and packets, as well as more unusual loads. With a nominal running speed of 0.4m/s, the Nerak C-shape platform elevator has a maximum throughput of 900 units per hour. Able to elevate or lower goods, the C-conveyor can be fitted with single platforms for products weighing up to 25kg or reinforced double platforms for items weighing 25 to 50kg. At the heart of every Nerak vertical conveyor is the renowned rubber block chain, achieving its high-tensile strength from embedded vulcanized steel cables. Its link-free format ensures quiet operation, avoids the need for lubrication and provides corrosion-free operation. With wear-resistant design and no ‘chain stretch’, the drive system has very low maintenance needs. Other advantages of the C-shape platform elevator include a small physical footprint where space is at a premium, along with a very low carbon footprint due to the absence of friction. 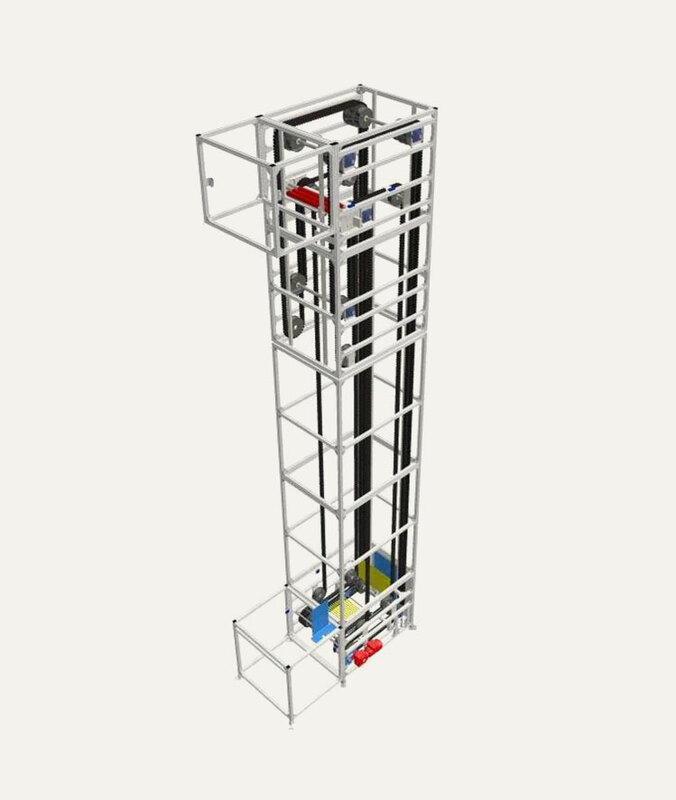 The elevator consists of 4 drive belts supporting modular platforms that build up under the product at the infeed point to provide a stable base for the vertical transfer. The platforms are able to flex at specific points, allowing them to circulate within the machine. In the vertical section the platforms remain rigid and horizontal, but they flex around the infeed and discharge points for the return journey. The principle is tried and tested and throughputs of up to 900 units per hour can be achieved. The unit is manufactured from aluminium profile and guarded with mesh cladding. Accessories and adjustment parts are supplied in mild steel with a powder-coated finish. A rear interlocked door will be provided for maintenance and cleaning access. All safety and control devices will be wired back to a locally mounted junction box for connection to the customer’s control system.